Successfully Added PULUZ fat cow mobile phone SLR camera set for live broadcast live rabbit cage with patch lamp microphone mini tripod to your Shopping Cart. If you like to record high-quality videos, this is a good tool. It makes shooting video easier because you have two handles for better grip. Using 2 standard shoe rack slots, you can get lighting and microphone accessories. A dreamy tool requires a higher quality mobile phone or video to approach professional level. Special design will enable you to take stable photos and capture unique life experience. You can install with any three tripod or slide rail. Compatible with most smart phones, sizes from 4 cm to 11 cm. The professional Mini LED light supplement, easy to carry mobile phone photography, for SLR cameras 1/4 inch internal thread, such as Canon, Nikon, SONY, and video cameras. 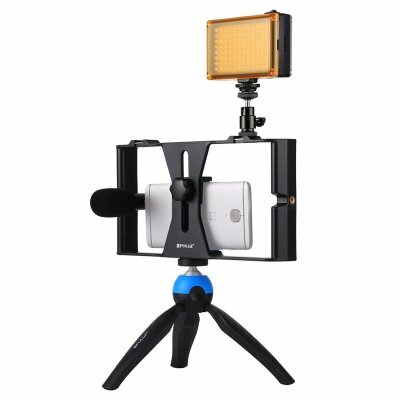 In addition, it can be used in the 1/4 inch three tripod to help iPhone owners shoot wonderful videos and photos. The microphone with MS stereo system can achieve natural pickup. The stereophonic sound is provided with high clarity. A portable, mini three foot frame that is perfectly suitable for shooting action segments at a fixed angle, but it can also be used as a handle to shoot video or photos with GoPro, small camera or smart phone.